New Book By hOurworld Member Laurie McCammon! Laurie says about her work: "Just like you, I've been following an inner calling to gather and support communities of conscious, caring people to make a better world. I wrote the book to bring research-based evidence, validation and support to all the organic arisings that are expressing a new, lighter consciousness on Earth." "My personal mission is to help people to know and experience the truth that we truly are already enough to achieve a massive global shift right now. One of the basic tenets of the book is that there is always enough when we remember to both pay it forward and give back. Service Exchanges do that naturally and gracefully. I am proud to feature a story about hOurworld members in the book." 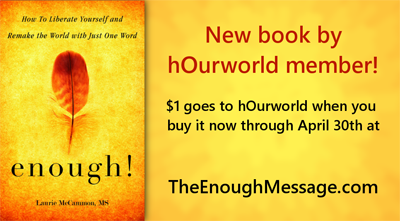 Laurie has made this generous offer to our Hour Exchange Community: "As an hOurworld member, I've learned so much and want my book launch to reflect the spirit of sharing and exchange. For every book purchased through my online store at www.TheEnoughMessage.com, I am donating $1 to an organization I deeply believe in. To direct my donation to hOurworld to support Time&Talents software, immersion training and storytelling, simply select the hOurworld option. If you'd like to match my donation with $1 donation of your own, I will thank you by signing the book(s) you purchase. I'll also include free shipping and a companion e-guidebook download to thank you." Laurie has been a supporter of hOurworld from the beginning. We are pleased to be part of her April 1, 2016 book launch by introducing her to you. Enough! is a thoughtful, inspiring read we at hOurworld wholeheartedly recommend. Creating Sustainable Societies: The Rebirth of Democracy and Local Economies by John Boik. This book first pinpoints the central problems within our financial, economic, and governance systems that have lead to high unemployment, massive debt, environmental degradation, mistrust of Congress and big business, and hyper-inequities of wealth and political power. The book then proposes a bold yet practical blueprint for addressing these concerns and creating meaningful change. Visit the website. People Money: The Promise of Regional Currencies by Margrit Kennedy, Bernard Lietaer and John Rogers. People Money is a comprehensive guide to the principles and practice of regional currencies. It shows how regional currencies can transform the lives and well-being of local communities, how they can sustain businesses, how local authorities can participate in their success and, consequently, why supporting regional currencies is of vital importance to the future of your community, region or country. Money and Sustainability: The Missing Link by Bernard Lietaer, Christian Arnsperger, Sally Goerner and Stefan Brunnhuber. Just as The Limits to Growth exposed the catastrophic flaws in our economic system, this new Report from the Club of Rome exposes the systemic flaws in our money system and the wrong thinking that underpins it. It describes the ongoing currency and banking crises we must expect if we continue with the current monopoly system  and the vicious impact of these crises on our communities, our society as a whole and our environment.